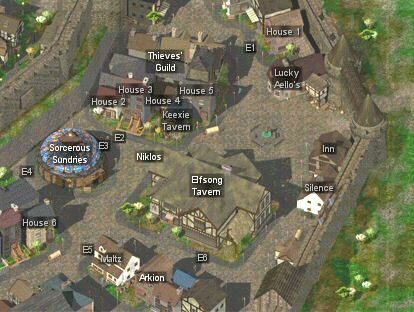 Owing to the sprawling nature of the quests in Baldur's Gate you should go to whichever part of the city provides the solution. Some quests require having an unsavoury Reputation. If you want to complete EVERY quest possible you should consider managing your reputation up and down by donating to churches, completing reputation boosting quests or commiting crimes to meet those requirements. If your Reputation is lower than 3 you will be attacked by groups of three Flaming Fist Enforcers, a Flaming Fist Scout and a Flaming Fist Battle Wizard. The Flaming Fist will attack suddenly both on the streets and in the Elfsong Tavern. Talk to Lucky Aello. All the items he sells are cursed, except for the Potion of Perception. Raid two drawers and the cupboard. You can pickpocket Niklos. Talk to him. He will give you 50gp to talk to his boss. Agree. He directs you to the Thieves' Guild and gives you the password: FAFHRD. Houses 2 - 5 all lead to the Thieves' Guild. Whichever door you use, give the password, and go through the north door of the room into the Guild AR0153. Talk to Alatos. If you insult him or refuse his quest you will have to fight all the guild's members. He wants you to steal some particular items from Oberon's Estate in Central Baldur's Gate (you have 10 days to do this). Also talk to Narlen for his sidequests. Complete both Narlen's and Alatos' sidequests before going to talk to Alatos for his reward. Alatos' employer (Resar) thinks you did a bad job and demands you killed. If you have completed Narlen's sidequests he will come to your aid. If you are quick you can get the experience for killing Resar yourself. If you didn't complete Narlen's quests then the guild will side with Resar when he attacks you. Raid the locked chest and the chest. Raid the sack, two chests and the drawers. Raid the barrel and box. Enter the Thieves' Guild AR0153. Narlen will hail you if you have a thief in your party. He wants the thief from your party to run a gauntlet of tests. Agree. Head to the Splurging Sturgeon in NE Baldur's Gate. Return to Narlen in the Thieves' Guild once you have completed the first test. If you killed the Flaming Fist he will leave. If you delivered no warning he will attack and you will have to fight the whole guild unless you run away (see Alatos). Otherwise he will give you the second challenge. Narlen wants you to steal a Rogue Stone from Gantolandan. Head to the Blade and Stars in SE Baldur's Gate. Return to Narlen in the Thieves' Guild once you have completed the second test. Enter the Thieves' Guild AR0153. Talk to Black Lily. She sells some useful items. Behind her in a barrel is a magic tome. Raid the locked cupboard and trapped and locked drawers. The two trapped and locked chests are empty. Enter the shop AR0703. Talk to Halbazzer Drin. He sells some useful items. Enter Sorcerous Sundries AR0703. Go upstairs AR0704. If you approach the four mages Niemain will warn you, and if you don't leave they will attack (unless Xzar or Montaron are in your party). Enter Sorcerous Sundries AR0703. Talk to Halbazzer Drin. He will offer to buy the Nymph Hair for 500 gp. If you decline he will offer to make a magical cloak for 100gp. Agree. Raid three bedside tables, a bookshelf and a cupboard. Enter the shop. He sells some useful items. Raid the crate outside, two locked drawers and a cupboard inside. Enter the locked house AR0805. Talk to Arkion. He wants you to collect a corpse from the sewers for his experiments. You should enter the E Sewers via sewer grate SE2 in SE Baldur's Gate then head west. Return with one corpse. Head to SE Baldur's Gate to find Nemphre. When you return you can pickpocket Arkion for his Bloodstone Amulet and then kill him. Return to SE Baldur's Gate to talk to Nemphre. Once you have Arkion's Bloodstone Amulet and Nemphre's Onyx Ring enter Sorcerous Sundries AR0703 and give them to Ordulinian. Raid the two locked bedside tables and the locked chest. Enter the Elfsong Tavern AR0705. Talk to Brevlik. Say that you will listen to him for money (you should only ask twice). He wants you to steal a telescope from the Hall of Wonders. OPTION 1 The best option is to agree to his offer of 500gp. Note that he attaches the condition of not killing any guards. * Head to the Hall of Wonders in W Baldur's Gate at night. Return with the telescope. If you killed the guards he will try to leave without rewarding you. You can either threaten him for a lesser reward, ask him what to do in which case he will leave after telling you, or attack him and he will summon the guard, naming you as the thief, before fleeing. * OPTION 2 Alternatively if you hear his offer of 500gp but turn him down saying you do not wish to be famous from inside a jail cell someone will rob him. Talk to him again and he will try to sell you a ring to cover his debts. It is a Ring of Folly and is not worth any of the prices you can pay for it. Enter the Elfsong Tavern AR0705. Go upstairs AR0706. Talk to Cyrdemac. You can persuade him to join you alone in a side room then kill him. Otherwise you can kill him in the main room in which case two ruffians will also attack you. Return to the Noblewoman in the Three Kegs in N Baldur's Gate. Talk to the Merchant. He sells some useful items. Talk to Alyth. She runs the Tavern. You cannot buy drinks from her if your NPC Reaction is 1-7. Raid the two locked cupboards, locked drawers, two cupboards, shelf and two locked chests. Talk to Silence. She sells some useful items. If your NPC Reaction is 8-14 you will have to pay 5gp to see her goods, if you refuse she will summon a guard. If your NPC Reaction is 1-7 she will attack unless you leave.